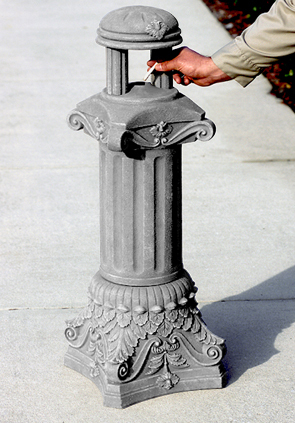 Complete the Roman theme with a fiberglass reinforced plastic Roman Column cigarette receptacle. All fiberglass construction, weather and corrosion resistant means this cigarette receptacle could become a real antiquity. The unit is made from a flame retardant fiberglass reinforced plastic to eliminate any fire concerns. This cigarette receptacle is a neutral, sand color with a textured feel of rough stone. Unit can be secured with chain or cable (sold separately) to prevent theft and vandalism.